VBS Direct Ltd - Homepage - Innovative solutions for the veterinary professional. 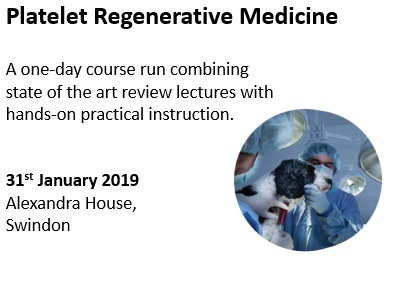 A one-day course run in conjunction with Improve International aimed at vets and nurses combining state of the art review seminars with hands-on practical instruction. What is Platelet Regenerative Therapy? It is a platelet therapy modality that can be used in the treatment of osteoartritis, damaged and poorly vascularised tissues (e.g. tendons, ligaments and cartilage) that usually do not heal or only very slowly, and often with scar tissue formation resulting in chronic pain and reduced range of motion. The use of Platelet Regenerative Therapy in practice including blood sampling, filtration, removal of platelet factor concentrate and patient administration.